The Josiah H. Penniman papers were transferred to the University Archives in 1968. The papers came mixed with Penniman’s Provost Office file. The Provost Office file of the Penniman term has been classified under UPA6.2P. The collection has been organized into two parts: the professional and personal papers of Josiah H. Penniman and papers of his family members. The first part has been arranged alphabetically; the second part has been sub-divided into the following groups–the Family file of the older generations, James Lanman Penniman file, file of Mrs. James Lanman Penniman (Maria Davis Hosmer), James Hosmer Penniman file, and file of Mrs. Josiah Harmar Penniman. 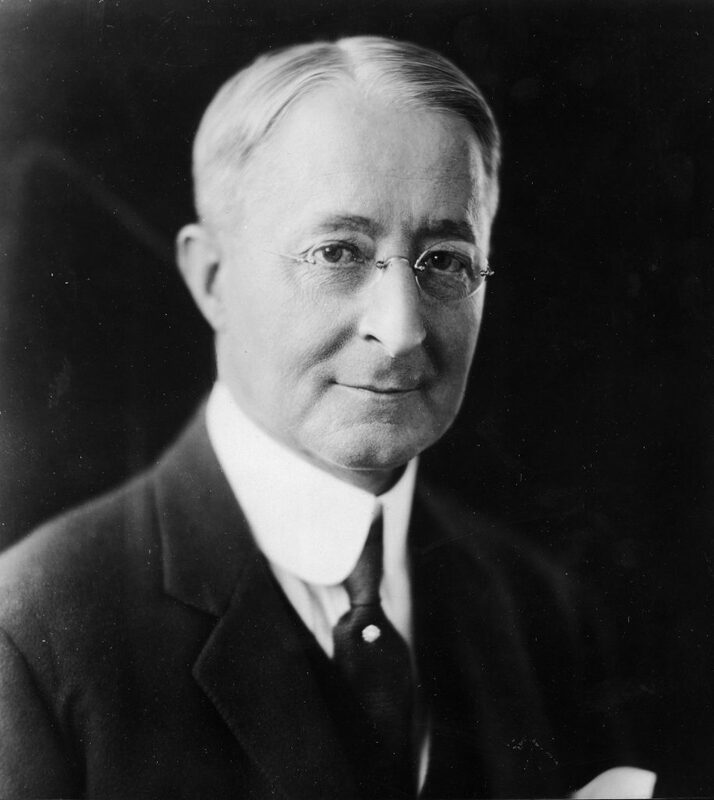 Josiah Harmar Penniman, fourteenth Provost of the University of Pennsylvania, was born in Concord, Massachusetts, on July 20, 1868. He was the son of James Lanman and Maria Davis Hosmer Penniman. His parents were of distinguished colonial ancestry, some of whom were among the founders of the town of Concord. Josiah received his early education at home from his father, a Yale graduate who was noted for his interest in literature. Later he attended the William Penn Charter School inPhiladelphia and after his graduation from that school, entered the University of Pennsylvania. Penniman graduated from Penn with the degree of Bachelor of Arts in 1890 and received Ph.D. from the same institution in 1895. When a student, he was editor-in-chief of the daily journal the Pennsylvanian. Penniman became a member of the teaching staff at Penn in 1892 when he was appointed Instructor in English. In 1896 he was appointed Assistant Professor of English Literature and Vice Dean of the College and the next year made Dean of the College. He was promoted to be Professor of English Literature in 1903. He resigned from the College deanship in 1909. Two years later, he was elected Vice Provost of the University. 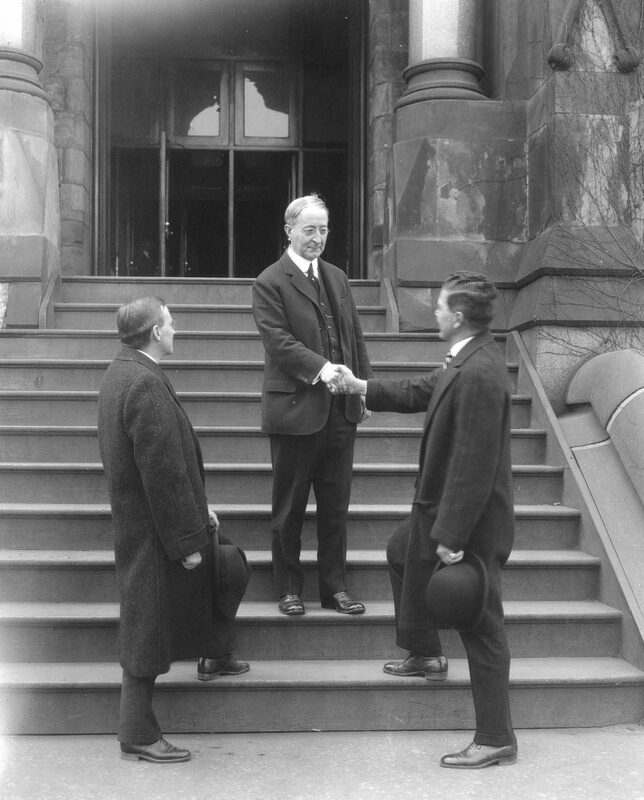 Upon the retirement of Provost Edgar Far Smith in 1920, Penniman was appointed Acting Provost. 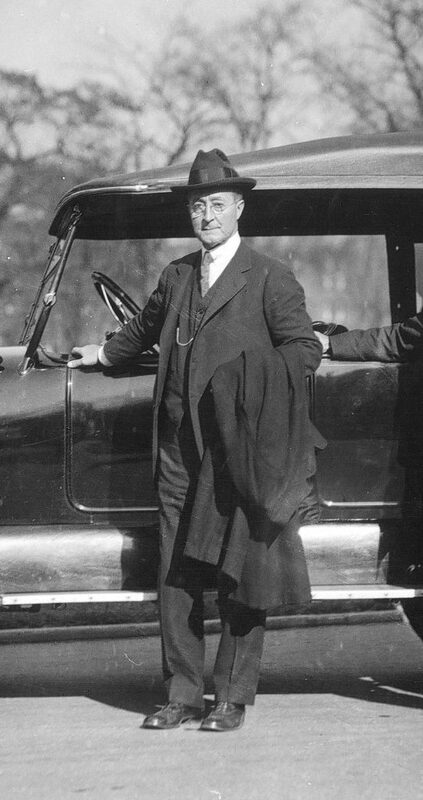 He was elected Provost of the University in January 1923 and for more than three years from July 1923 to late 1926 served as both President and Provost of the University. He held the position of Provost until 1939 when he retired. Penniman was the author of two books–The War of the Theatres and A Book About the English Bible–as well as many articles on literary and educational topics. He was also the editor of Ben Jonson’s Poetaster and Thomas Dekker’s Satiromastix in the Belles Letters Series in 1905. He received honorary degrees from a number of universities and colleges, which included the University of Alabama, Washington College, the University of Pennsylvania, Ursinus College, Juniata College, Lafayette College, Franklin and Marshall College, Swarthmore College and Muhlenberg College. In addition to his academic and educational activities, Penniman had a keen interest in civic affairs. He was invited by many institutions for public speeches and addresses. In 1926 he was awarded the Kiwanis Medal in Philadelphia for distinguished civic service. In 1925 he was also appointed lieutenant-colonel in the Special Service Officers Reserve Corps of the United States. Penniman was a member of many distinguished academic or civic societies, among them the American Philosophical Society, the Modern Language Association of America, the American Dialect Society, the American Society for the Advancement of Science, the English Association of Great Britain, the Society of Colonial Wars, the Sons of the Revolution, and the Royal Societies Club and the Pilgrims in London. Penniman’s brother, Dr. James Hosmer Penniman, was also a widely-known author and educator. He devoted much of his time to the study of the life of George Washington and to the development of memorial libraries at Penn, Yale and Brown universities in honor of his parents. In 1929, the United States Geographic Board honored the two brothers by naming two hanging glaciers in Alaska after them. James died in 1931. Penniman was married in June 1929, to Ida Jutte Walther of New York City, a widow with three children. He was an affectionate son, brother, and husband. This collection consists of two parts, the professional and personal papers of Josiah H. Penniman and papers of his family, mainly, his father James Lanman Penniman, his mother Maria Davis Hosmer, and his brother James Hosmer Penniman. The two parts are interlaced, especially in the Chronological file, which includes correspondence and memorabilia items generated by all family members from year to year. The Josiah H. Penniman file consists of the following groups: Articles and papers; a Book collection; a Chronological file; a General file; Speeches and Addresses; and Photographs. The Articles and papers file, the General file and the Speeches and Addresses file represent the academic and professional activities of Penniman both as professor of English and university administrator. The articles and addresses cover a wide range of topics, among them education and the society, Christianity and religion, literature and the Bible, etc. The Chronological file represents primarily Penniman’s personal and family life. It consists of correspondence between family members (especially correspondence between Penniman and his mother and his brother James), notes and speech drafts by Josiah Penniman, examination papers, clippings, notebooks, programs, and memorabilia items such as certificates, passports and travel brochures that originally belonged either to Josiah or to his mother or his brother. The Chronological file occasionally also includes some administrative correspondence between Penniman and other Penn leaders. The Photographs file includes seven folders. In addition to Penniman’s portrait photographs and family photographs, there are group photographs taken during various events of the University of Pennsylvania. The family file is divided into five sub-files: the family file of the older generations; the James Lanman Penniman file; the Maria Davis Hosmer file; the James Hosmer Penniman file; and Mrs. Josiah H. Penniman file. The family file of the older generations includes correspondence and miscellaneous material concerning Penniman’s ancestry dating back to the seventeenth century. In addition to material of the Pennimans and Hosmers, this file also includes material of several other New England families–the Lanmans, Fosters, Harmars, Hubbards, and the Precotts. The James Lanman Penniman file, the Maria Davis Hosmer file and the James Hosmer Penniman file are similar in composition. They all comprise family correspondence and correspondence with their friends and New England relatives. American Society for the Advancement of Science. English Association of Great Britain. “Christianity and the Intellectual Classes,” n.d.
“Some Impressions of Educational Problems in the South,” n.d. Criticism of Sir William Temple’s Essay upon Ancient and Modern Learning, n.d.
George Washington in Philadelphia, n.d. Regulations of College Athletics, n.d.
Memorabilia–two hatbands of Class of 1890 and two pen points, n.d.
“Bearing on the Old Testament of Archaelogical Finds made by the University of Pennsylvania at Nippur in Babylonia,” n.d.
“Scientific Spirit in Higher Education,” n.d.
“Shall Industrial or Vocational Subjects be Accepted for Admission to College?” n.d.
“Some Rambling Thoughts about Oxford,” n.d.
“The Problem of Finance and Equipment to Keep Pace with Growth,” n.d. The English version of the Bible, n.d.
Washington’s Birthday Address before the University of Louisville, n.d.
Family house, three photographs, n.d.
Penniman and his family, n.d.
“George Washington as Commander-in-chief,” n.d.
Paper “The Nymph of the Bay,” n.d.
Paper: “The Child and the Book” n.d.